EchoLab by rs-met is a Virtual Effect Audio Plugin. It functions as a VST Plugin. 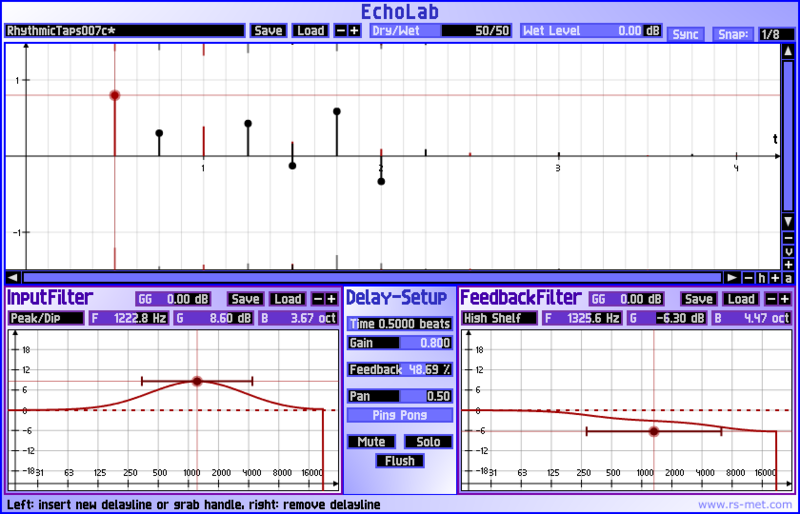 EchoLab is a plug-in for creating a wide variety of delay and echo effects. It provides an arbitrary number of delay-lines each of which may have feedback, may be placed independently in the stereo panorama and may be switched into 'ping-pong' mode (which means alternating panorama positions for successive echoes). Moreover, each delay-line has two filters associated with it - one sitting in its input path, the other one sitting in its feedback path. These filters themselves are made up from a series connection of an arbitrary number of stages and the frequency response of each such stage can be chosen from 8 different characteristics.